Visits: 27482 persons viewed this recipe. Kalan is a curd based raw plantain – yam curry. It holds a unique position in Sadya particularly Onam Sadya (a traditional vegetarian banquet served in plantain leaf). The main difference between kalan and other curd based curries are it has a much thicker consistency and it uses pepper powder as one of the ingredients. 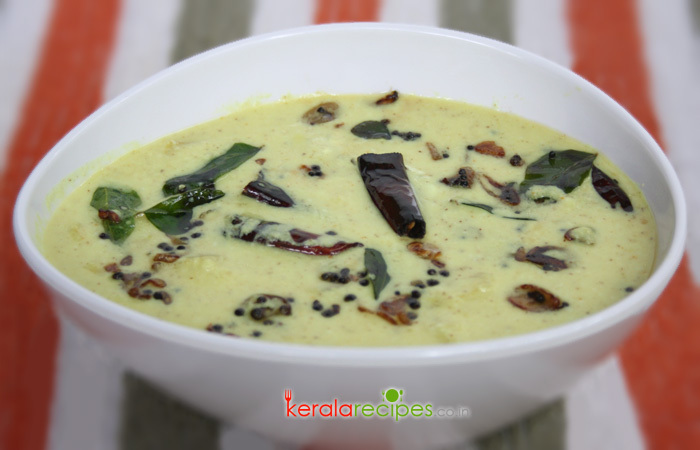 Here you can try a kalan recipe which is commonly served across Kerala. It has many other variations like rasa kalan, katti kalan or kurukku kalan etc. Peel the skin of plantain and elephant foot yam. Cut it into thick cube pieces and set it aside. Slice the green chillies (length wise). Cook the plantain and yam cubes in a vessel by adding 1 cup of water, green chillies, turmeric powder, pepper powder and salt on a low flame till it tender and dry (be careful not to overcook it and also take care to prevent it from burning). When it is done, add ghee into it. In the meantime, beat the curd without adding water. Make a smooth paste of grated coconut and cumin seeds. Add it into the cooked vegetables and simmer for a few minutes. Pour the curd into it and combine well. Add salt to taste. Simmer for another minute by stirring well all the time. (Remember to keep the flame at the minimum or lowest possible. Take care not to overheat it after adding the curd). Taste for salt and remove from the flame. Heat 1 table spoon coconut oil in a cooking pan, put mustard and fenugreek seeds. When it splutters, to this add broken dry red chillies & curry leaves and saute it. Remove from the flame and wait for 2 minutes to bring down the temperature. Add this sauteed mix to the prepared kalan and combine it. Serve it as a side dish for rice. Follow the steps closely and take care not to overheat the dish as the curds will separate and leave you with an inedible dish. Mr. Shaan, I m not a good cook, but i tried the following receipes Olan, Erissery, Ulli theeyal, Pulissery as per your recipes and it has come out well. Every one at home were surprised about my cooking and they all liked very much. Thanks a lot. Keep the good work going. Hi Sreelatha, Thanks for taking time to post your feedback here. Great to know that the recipes came out well for you and all of you liked it. I will be posting more recipes in the near future. Thanks again for trying this recipes and posting your comments. How are you, actually I didn’t cook kalan, because I don’t know how to prepare. But when I saw your recipe and I tried this. Its very nice and all credit goes to you thanks a lot and Take care. Thanks for the recipe. tried this recipe today and it came out really well. Can you post tenga chaar recipe. You are welcome Vijai. Nice to know that the kalan recipe came out well for you. Sorry, I didn’t get tenga chaar, you mean Thrissur style manga curry prepared in coconut milk? Thanks for the recipe and it came out really well. Good job. Thank u. You are welcome Merlin. Great to know that the Kalan recipe worked out well for you. Thanks a lot for taking time to share your feedback. First I want say thank to you thanks. Becoz this onam I want to celebrate with my friends with a best onam sandya. I search in online there I got lot of kerala recipes of yours. Its awesome. I am going to try some recipes. Hope it will be come out well. I will try my best. Again thanks for you. Aathira, No need to beat the curd like butter milk, just beat it for few seconds.